Regular subscribers of the Wild Apricot Newsletter will recall that about 6 months ago, we refreshed our template format to make it more user-friendly for sharing a variety of information. Now, every month in our newsletter, we remind our clients to write us recommendations on third party review sites -- it's just one of the ways we try to harness the power of word-of-mouth using social media and the Internet! A few days after we sent out our April newsletter, I noticed new reviews on all of our social media sites from an Emily Eldredge. "Who is this person that wrote us so many glowing reviews?" I asked myself, "Did she come from our newsletter?" Thanks to the magic of link-tracking, I was able to determine that: "Yes! She did click on our newsletter links!" I found out that Emily is on the Board of Directors at Women In Film.Dallas, sits on the Publicity Committee and is the webmaster of their Wild Apricot site. Not only did we want to thank Emily for the many great reviews she posted for us, we also wanted to compliment her on her recent Wild Apricot site redesign, and find out more about her work with Women in Film.Dallas and Wild Apricot. I sent her an e-mail to this effect, and on top of the many reviews, she was also more than willing to answer some questions for this Apricot Chat column too! Women In Film & Television International (WIFTI) is a global network comprised of approximately 40 Women In Film Chapters worldwide and over 13,000 members dedicated to advancing professional development and achievement for women working in all areas of film, video, and other screen-based media. In addition to Women in Film.Dallas, a few other WIFTI chapters also use Wild Apricot, including Women In Film Atlanta, Bay Area Women in Film & Media, Women In Film Chicago, and Women In Film & Video New England. The first WIF chapter to start using Wild Apricot signed up in May 2008. 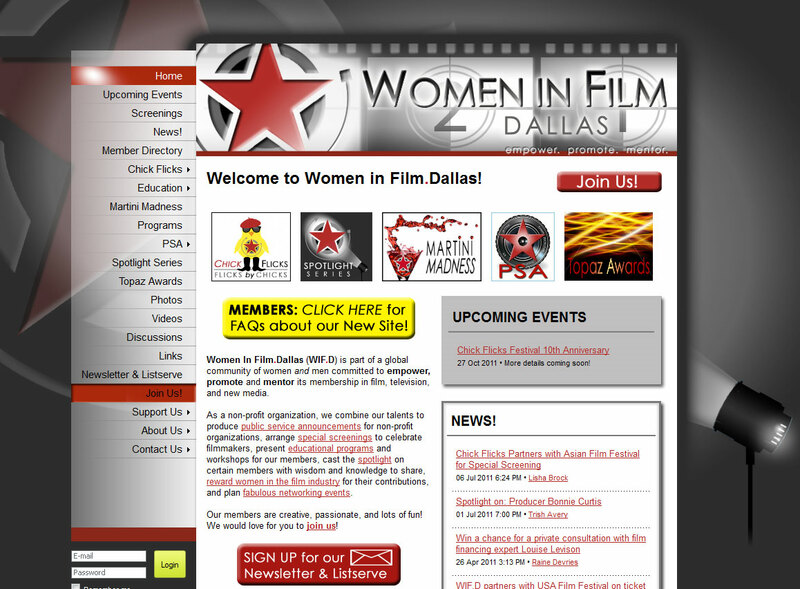 Women In Film.Dallas is the latest chapter to join Wild Apricot, in February 2011. 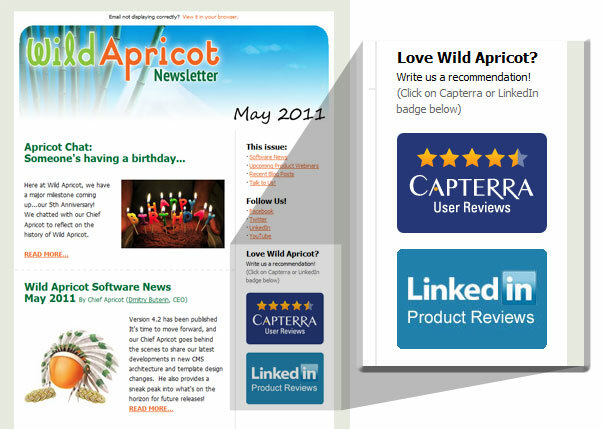 Prior to using Wild Apricot, Emily says that their previous chapter website was "unattractive" and "very difficult to navigate". "Other than simply serving as our website, it provided no organizational tools to support our efforts or our members. We were in desperate need of an update!" Not only was their website not performing at its best, it didn't enable efficient tracking of their membership, which was spread across five (5!) multiple systems. Their previous website was built in Joomla, and only their webmaster could make changes. Although members could sign in through the site, their names had to be manually updated through their membership list service (MyEmma), which they cross-referenced with PayPal to track payments. All in all, it sounds like quite the headache! "Soon after I came on the Board and offered to redesign the site, our former president suggested Wild Apricot. I compared it with other options, including the option of having a web designer cobble together various functionalities through a WordPress platform, and ultimately decided on Wild Apricot. After all, it had everything we needed and all in one place!" I asked Emily if there was a particular situation where using Wild Apricot had greatly affected her organization's ability to function. Her answer? "Wild Apricot has changed everything! Where do I begin?" I have to say, working in marketing for a product that influences its customers so positively is a very rewarding experience. These are the answers we love to hear! "Wild Apricot covers all of it, and for a lot less money. Members can join, update their own profiles, register for events, search our member directory, and receive email blasts from us. Our Membership Committee has all of the information they need and can easily keep track of our members all in one place, our automated email system sends out renewal reminders, and we've been able to eliminate the paid administrative position that was handling all if this before - saving us money. Updating the website is ridiculously easy and can be done by all of our board members, depending on their administrator level. They can post events and news announcements, update the information and images on their respective pages, send out their own email blasts, and more. 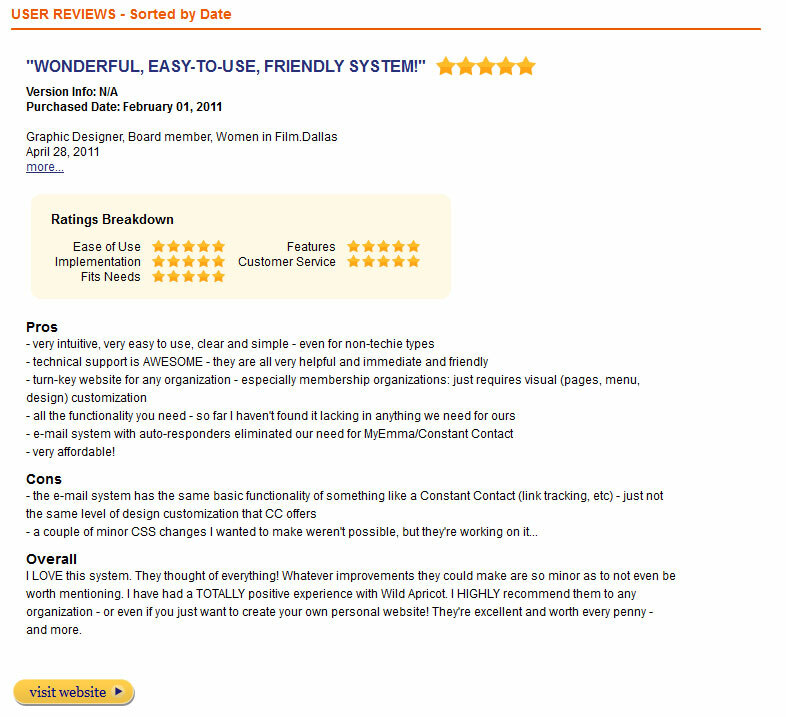 Everyone on our board has been amazed by how easy the back end system is!" When asked to choose a personal favorite feature in Wild Apricot, Emily hesitated -- "It's hard to pick just one!" -- but ultimately, she decided on our website editing capabilities. I almost cried when I saw how easy it was -- and would be for our board members. Little functionalities like these that make website building and maintenance easier are what I appreciate about Wild Apricot. You really paid attention to the details, and we at Women in Film.Dallas are grateful." To achieve their look, Emily used Photoshop to create the logo, header, background image, and some of the more minor graphic details on their site, and used CSS Customization to insert the background image, as well as change the menu images and a few other design details. Wild Apricot's online help documentation explains how to tweak almost every part of a website, and if clients get stuck, they can always call or e-mail our support team, who will happily walk them through what they're trying to do. We recently updated the software to allow more template customizations (currently in beta), and we're working on developments for Version 5.0 to make our website editing capabilities even easier to use -- read more about that in this month's Software News. More than anything, I wanted to know what prompted Emily to take the time to leave nice comments about us all over the internet. "Because you guys are awesome!! I've used several CMSes before Wild Apricot, and you all are by far the best! So easy and user-friendly. I've already designed another site and am in the process of transferring two of my personal sites to Wild Apricot as well! Plus, the fact that you're friendly and your support team is incredibly responsive makes it easy to recommend you." 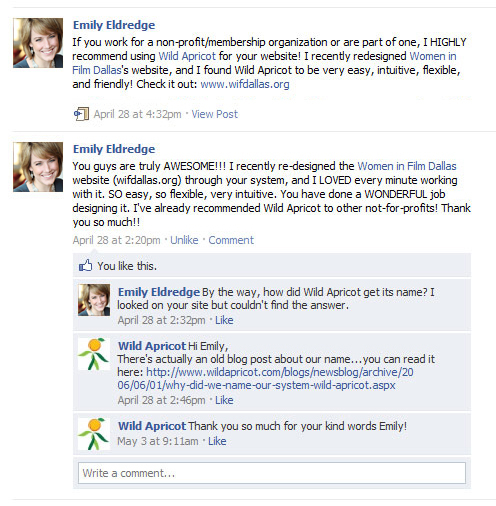 Be like Emily -- let people know what's great about Wild Apricot!